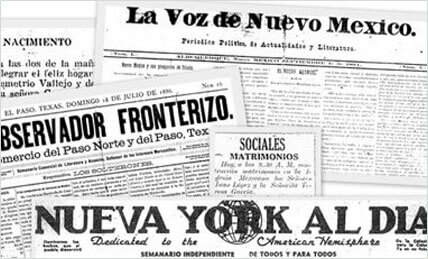 Trace your Hispanic Ancestory in Spanish Newspapers Online! Enter a name below to search your Hispanic ancestors. "One of my most elusive ancestors was Patrick Flood. Found his funeral announcement on GenealogyBank in the New York Herald in 1863, with the parish in Ireland that he was from. I was doing a jig for a week." Popular Hispanic American periodicos easily searchable in our exclusive online archives include: Clamor Publico, Hispano Americano, Prensa, Misisipi, Mexicano, and over 360 more! 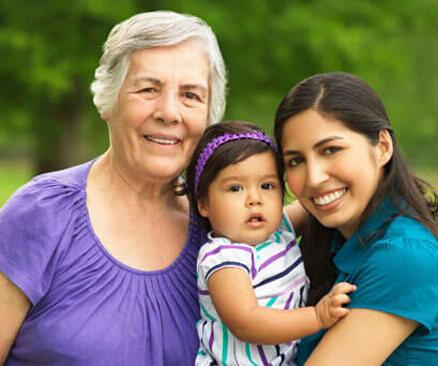 Discover Your Hispanic Genealogy In The U.S. If your family is of Hispanic or Latino descent, use our Hispanic newspaper archives to learn more about your ancestors and family history. With just a name and date, you can search thousands of Hispanic American newspaper articles. These newspaper archives provide great insight into what life was like for your ancestors. Hispanic-American newspapers captured and preserved the vibrant culture and heritage of Hispanic peoples in America for almost two centuries. The articles hold the stories and details of defining moments in Hispanic-American history including Puerto Rico citizenship, the first Hispanic Senator, the Zoot Suit Riots and more. Our collection starts with the first Spanish-language newspaper printed in 1808 in New Orleans and includes publications from across the United States. Search obituaries, public announcements, and more in Spanish language newspapers to discover more than the just names and date on your family tree. And, with Hispanic newspapers from almost every state, you can narrow your search to specific cities. Discover more about your Hispanic ancestry and the lives of your ancestors - their stories, triumphs, hardships, and more!